It’s not unusual to catch cold or suffer from flu during winters. If it’s not serious, then the symptoms go away in a few days; however, there are times when a simple cold can turn really bad. Bronchitis has similar symptoms like cold. While the symptoms of cold may be over in a week but if it’s Bronchitis, it will keep lingering for weeks. 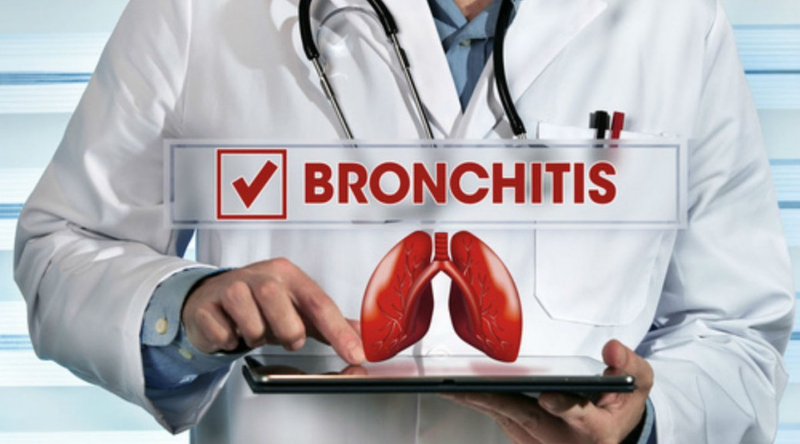 Let’s take a closer look at the causes and symptoms of Bronchitis. Bronchitis is an inflammation of the inner mucus lining of the bronchial tubes, the main airways which carry air to lungs. Because of the inflammation, the tubes become narrow and secrete thick mucus, or phlegm. When you have Bronchitis, you are often coughing up thick mucus which can be pale and discoloured. Bronchitis can be Acute or Chronic. Let’s discuss more on these two types. Acute bronchitis often develops from cold or from a respiratory infection. This condition is very common. In Acute Bronchitis, the bronchial tubes are suddenly inflamed and this generally happens due to a viral infection or inhaling something that irritates your lungs (such as dust, smoke, tobacco, or due to air pollution). Bacterial infections may also result in acute bronchitis. This condition is also referred as Chest Cold and it usually improves within 7-10 days and does not cause any lasting effect. Acute Bronchitis: How it affects your body? In acute bronchitis, the cells that are lining the bronchi are infected. It usually starts with a sore throat or a runny nose and then spreads to the bronchial tubes. When your immune system tries to fight the infection, the bronchial tubes swell. This makes you cough. Initially the cough is dry, but later on the cough may bring up mucus. You also feel shortness of breath and tightness in the chest. Acute Bronchitis usually lasts for 10-days maximum as your immune system eventually fights the infection. However, the cough and mucus discharge may last for several weeks even after the infection is gone. This is a temporary condition and usually does not cause any permanent trouble. However, if you have a weak immune system or any other major health issues, you may develop respiratory problems and even pneumonia. Usually elderly, young kids, people with health conditions such as diabetes, cancer, pneumonia or a whooping cough are at risk of developing serious health concerns from acute bronchitis. If the cough symptoms are not healed within7-10 days and get worse, you could have pneumonia or asthma. Viruses cause 85% to 95% of cases of acute bronchitis in healthy adults. When viruses attack bronchial tree, it causes the bronchial tubes to swell, and mucus forms. The viruses that cause colds can cause Acute Bronchitis. Acute Bronchitis can also be caused by bacterial and fungal infections. But, these are less common causes. Exposure to irritants such as dust, smoke, air pollution, and fumes can irritate the lining of the bronchial tube and can cause acute bronchitis. Compared to Acute Bronchitis, this is a more serious condition. A “Chronic” condition lasts for a very long time. Chronic Bronchitis is when the symptoms of the condition last for more than 3 months. It’s the constant inflammation or irritation of the linings in the bronchial tubes. In most of the cases, Chronic Bronchitis occurs along with Emphysema. And these two conditions together cause Chronic Obstructive Pulmonary Disease (COPD). Avoiding Chronic Bronchitis: Is there anyway? The first and the most important thing you can do to avoid Chronic Bronchitis is to quit smoking. The more tobacco smoke you inhale, the more damage it causes to your lungs. Once you stop smoking, you will see that you can breathe in a better way as your lungs start healing. This also reduces your chances of getting lung cancer. Second hand smoke can also cause chronic bronchitis. So, take necessary precautions. Also, extended exposure to irritants like spray paints, deodorants, and other aerosol products can cause chronic bronchitis. If you are exposed to chemical fumes and dust at your workplace or you work with paint, varnishes, or paint removers, then wear masks. There can be many causes of Chronic Bronchitis, but the main cause is cigarette smoke. Other irritants such as smog, solvents, and other industrial pollutants may also cause Chronic Bronchitis. Sometimes, acute bronchitis can also lead to Chronic Bronchitis. A number of other underlying conditions such as cystic fibrosis and congestive heart failure, may cause Chronic Bronchitis. However, these are less common causes compared to smoking. How Ayurveda can help relieve Bronchitis? As per Ayurvedic principles, Bronchitis is mainly a combination of weak digestion and incomplete elimination of waste from the lungs that causes accumulation of Ama or mucus. As a result, the lungs become a perfect breeding ground for infection. Moreover, poor lifestyle and blood circulation, stress, lack of rest also impact the immune response of the body to the viral infection. At Pankajakasthuri, we go deep into the underlying causes of Bronchitis. No condition can be cured just by relieving symptoms. Our Breathe Eazy tablets ease the breathing trouble along with improving your immunity. Moreover, our Ayurvedic products and medicines are 100% herbal and do not contain steroids. Also, embrace healthy habits such as eating healthy food. Regular massage with warm sesame oil will help in pacify your Vata Dosha and ease the Kapha Dosha in your chest. Drinking hot herbal drinks can be relieving. Ayurveda is not just a science of healing but it’s a part of your daily life. When included in your daily routine, Ayurveda can help you get healthier and happier.